Conquer Casino knows how to treat its guests. 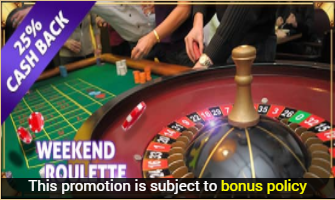 Play Roulette Table from Saturday until Sunday and in the unfortunate case you run out of luck, you’ll get a 25% Cashback Bonus on aggregated losses. In order to become eligible, you must deposit a minimum of £10 using the promo code CASH. The payments will be awarded the following Monday. Wager your bonus amount 50 times so you can withdraw your winnings. Start playing right away and claim what’s rightfully yours.